Poll: Do you want a scoreboard for agario scrims/tournaments as an agar feature? Update 2018 November: replace atahub.pro/atahub.ml with agarhub.pro/agarhub.me. 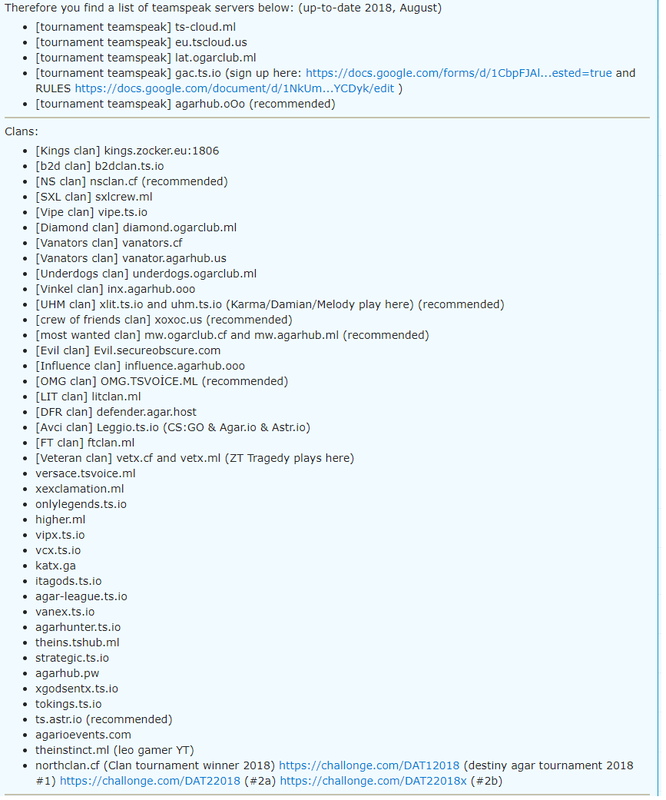 For your information: This list is made by and for agario players. If you got one also, post other teamspeak servers here. Soon is the new AGARIO tournament. EU and NA combined. Terax: "Basically, the first round would be played in EU, the second in NA and the third (if it needs to be played) is a controversial topic. We have a couple ideas on how we're going to do this and we will publish this in a strawpoll soon so that the community itself can vote on how they want us to do it.﻿"
Melody: "This tournament we're hosting is a little different than others. For a long time tournaments have been hosted seperatly; one for NA teams and one for EU teams. We are attempting to change that. In this tournament, both EU and NA teams will be playing against eachother. The main reason for this is that agar.io is a dying game, and everyone has to recognize that a tournament with only 10-15 teams, is no fun. This tournament will have 32+ teams playing toe to toe to decide what agar clan is not just the best of their region, but of the entire world!"